Ande Lai has a great view. He bought his two-bedroom apartment in Golden Mile Complex in 1986 with this view in mind. Standing on his 14th-floor balcony, he could see where the Kallang River emptied in the Straits of Singapore. He could see the old national stadium. At low tide, he could smell the ocean. He hoped that moving closer to his photography shop, which he ran out of the first floor of the building with his wife, would allow him to spend more time with his 1-year-old daughter. This was before Golden Mile Complex itself and three other post-independence landmarks were under threat of demolition. These buildings were completed in the wake of Singapore’s independence from Malaysia in 1965 and are widely considered to be architecturally significant. Golden Mile Complex is one of the four post-independence structures including People’s Park Complex, People’s Park Centre and Golden Mile Tower that are up for sale by their owners. Each of the four properties is held under strata-title ownership, a technical term describing a multi-owner collective. Each collective has begun the search for a buyer who will take over the building from the current occupants. If the sales are successful, these buildings might be demolished and the site redeveloped. Right now, none of the four buildings have been publicly designated for conservation. When Singapore became an independent country in 1965, the site now occupied by Golden Mile Complex looked very different. Visitors saw a haphazard and congested landscape of shophouses, kampongs—traditional villages—and shipyards. Golden Mile Complex and Golden Mile Tower were developed as a part of the Government Land Sales Programme, started in 1967, which leased land for 99 years to private entities to transform the city of shophouses to one of skyscrapers. City planners envisioned a “golden mile” of architectural showpieces stretching along Beach Road, a major coastal road in Singapore built under British colonial rule. Golden Mile Complex was the first building to be built on the golden mile in an effort to increase middle-class housing options. In Golden Mile Complex, the commercial, retail and residential areas intersect. In the decade after gaining its independence, Singapore changed rapidly. People moved out of congested shophouses or kampongs and into new apartments. Golden Mile Complex, with its iconic stepped form, emerged as a symbol of this rapid national development. 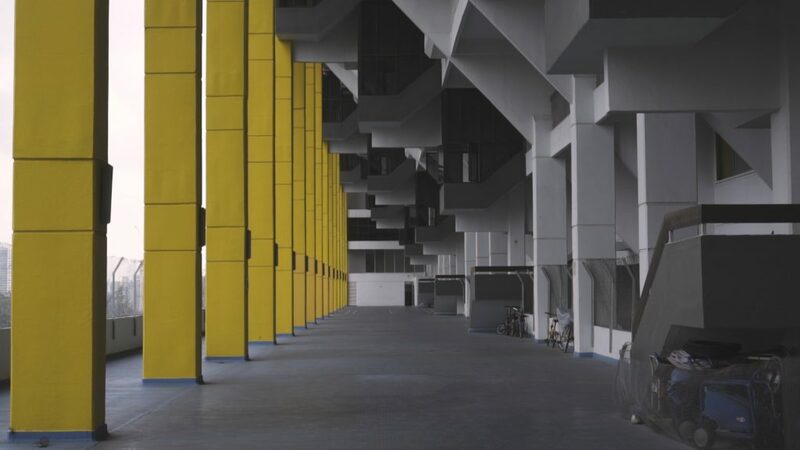 Brutalist and Metabolist, Golden Mile Complex synthesized the prevailing international architectural aesthetic with a young nation’s ambitions of urban renewal. “This [landscape that represented an era] is what we are trying to safeguard for the future generation, because you only go through nation-building once. Once that era has passed, you can never replicate the people who built it, who dreamed this, who believed they could do it—local architects, planners, builders,” said Ho Weng Hin, a local conservation architect. Golden Mile Complex was completed in 1973, and Golden Mile Tower, its next-door sister building, was completed just a year later. As the city changed around him, James Ang Chai Yong made plans to leave teaching and start his own insurance business. He found a unit in the newly completed Golden Mile Tower. Finding the space too big for just an insurance business, he decided to expand his enterprise to include selling stationery. Meanwhile, in the neighbouring Golden Mile Complex, a new Thai restaurant opened its doors to the burgeoning Thai community in Singapore, especially Thai construction workers. Twenty-three-year-old Yuang Somchua had just arrived in Singapore four years prior from her hometown Chiangmai in Thailand. In 1983, she opened her first restaurant, Diandin Leluk Thai Restaurant, serving Thai food in Golden Mile Complex. Ang and Somchua still occupy their units, but little else has remained the same for this Brutalist icon. In 2006, a politician described Golden Mile Complex as a “vertical slum” and a “national disgrace.” Years of poor maintenance, low occupancy and low rent had caused the building’s physical state to deteriorate. Ho explained that the physical decline of Golden Mile Complex stems from its status as a strata-title leasehold property. Unlike many malls built in the past decade that are often owned by one developer, strata-title malls have hundreds of individual owners. At the start of the lease, everyone pools money into a fund, known as a sinking fund, which is used for building repairs. But over time, the money dries up. “There is no mechanism for the sinking fund to maintain the cash flow,” explained Ho, who works as an architectural conservation consultant. The shared swimming pool has long been drained and lies unused, abandoned. A 2004 effort to upgrade the air-conditioning vents left exposed air-conditioning pipes snaking across the mall ceiling. Pipes often leak into residents’ bedrooms and balconies. Individual owners embarked on DIY construction projects, covering their balconies—with the view that Lai so loves—with corrugated sheet metal, marring the iconic stepped facade of the building. One of the lifts is broken; the parts used in the lift are now obsolete and have to be custom ordered from Japan, explains a sign. As original residents abandoned the deteriorating building, some units were subdivided and rented at low cost to Thai workers. Five to 10 people live in units meant for a small family. Lai estimates that nine out of 10 of his current neighbours are Thai. 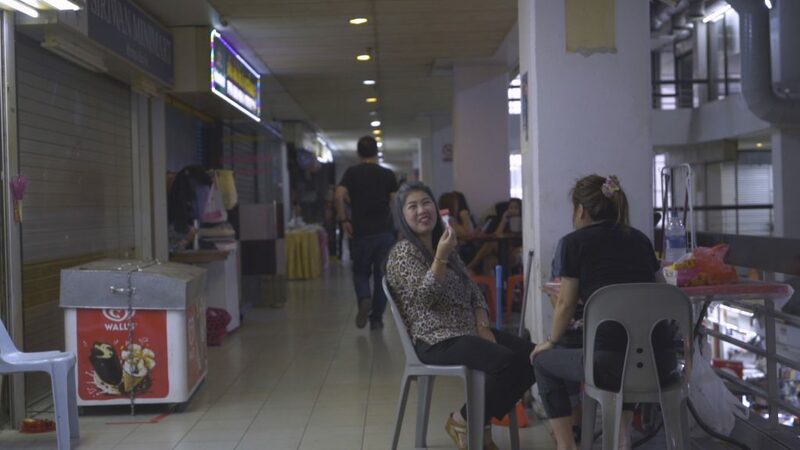 Even with the in-house Thai community, business has been hard for Somchua and she is planning to relocate her restaurant to Guangzhou in China later this year. Customers have stopped frequenting her restaurant the way they used to. At mid-afternoon one day in June, Diandin Leluk was a quarter full with customers. Somchua, along with 724 other owners who together hold 80.83 percent of the total share value of Golden Mile Complex, is in favour of the collective sale. 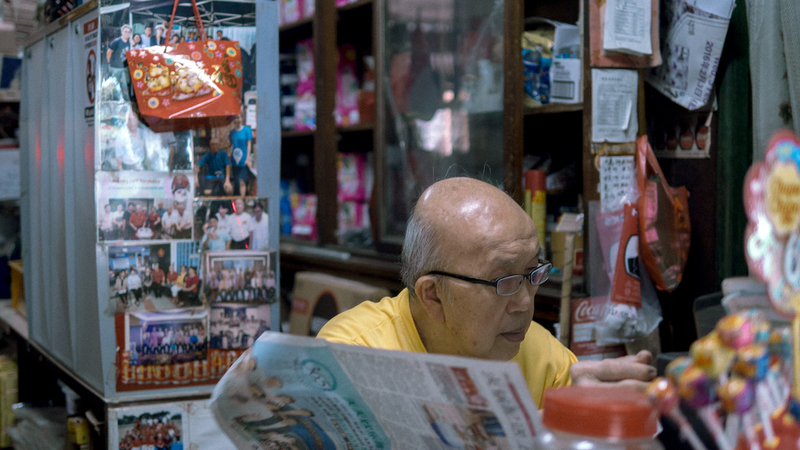 “Most owners are quite old, so I don’t think they want to continue [to run their business],” Ang, who runs the stationery shop in Golden Mile Tower, explained. Ang and his wife hope to retire after selling their unit. Many owners make money by renting out their units. But because the rental value of the space is very low, it is hard to make a living this way. On the other hand, the building sits on prime real estate, well-located in the city center, and could sell for a higher price. 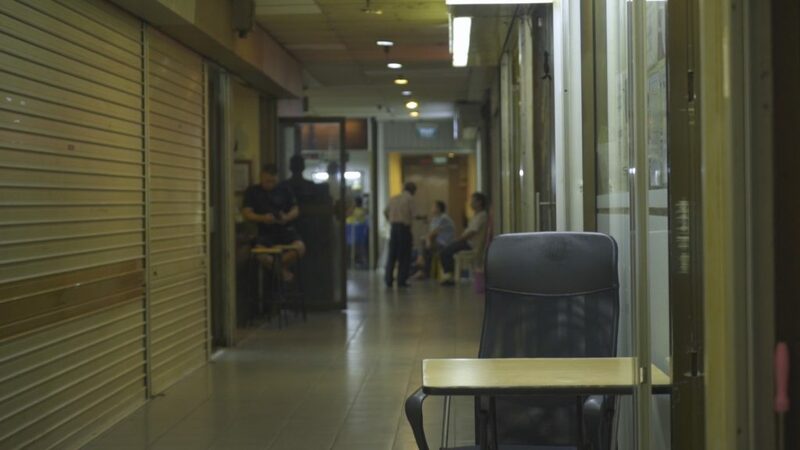 While the vast majority of people who own commercial units support a collective sale, Lai said that there are more residents who do not want to sell their units. For one, residents expect that there will be a disparity in the payout for residential and commercial owners. Lai, who is on the collective sale committee for Golden Mile Complex, said that the en bloc price will be about S$1,400 per square foot for an apartment unit. 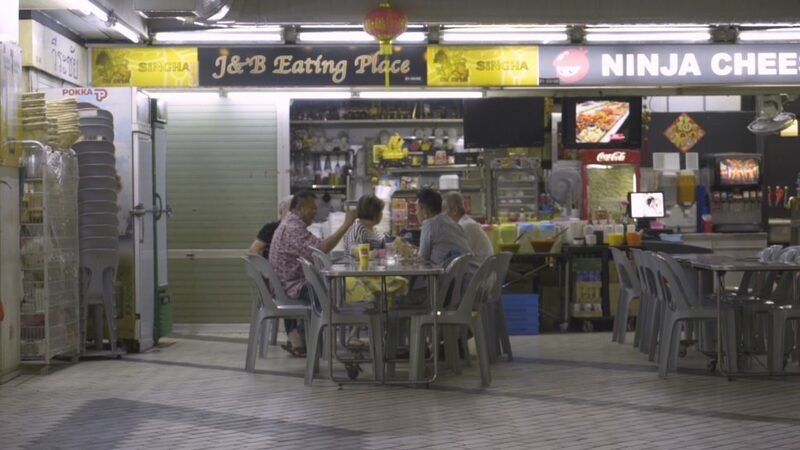 But shop owners like Ang in Golden Mile Tower predict the commercial unit en bloc price will be at least S$2,000 per square foot, if not more. If the building is sold, Ang could walk away with as much as one and a half million dollars. Many residents are tenants who have little say over the fate of the building. Others, including Lai, find themselves in the minority of homeowners unwilling to sell their homes. For each of the four buildings to be sold, there needs to be a consensus among owners holding 80 percent of the building’s share value and area. As long as the 80 percent agree to sell, minority homeowners will be silenced. “If 80 percent [of the people want to sell their units] then I have to go. … I’m not against the 80 percent of people who want to sign it. You can’t fight the 80 percent,” Lai said. 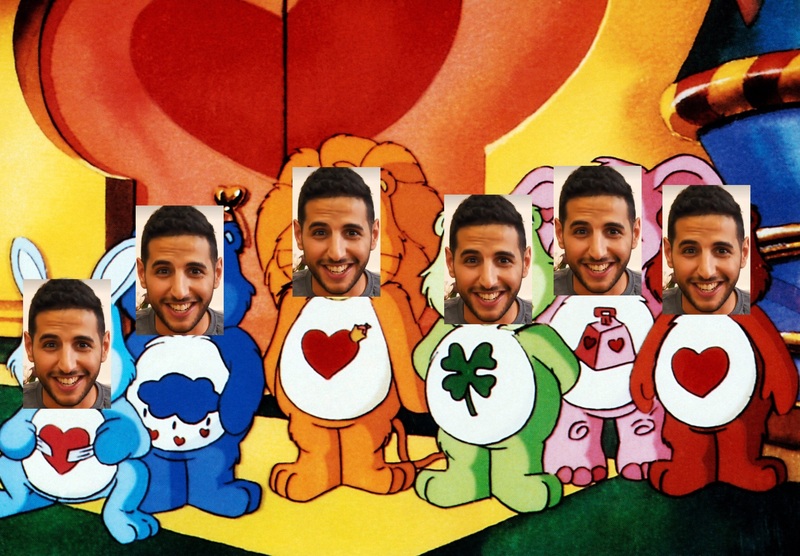 He added that many people attach a strong sentimental value to the place. He and his wife, for one, enjoy living there. Most importantly, he does not think he will be able to buy a new home with the same view, convenient location, and spaciousness that he has in Golden Mile with the money he expects to receive from the sale. Some people, particularly architects and historians like Ho and Chang Jiat-Hwee, a professor in modern architecture at the National University of Singapore, hope that the government will take steps to protect the building from being demolished by designating the building for conservation. Citing concerns about sustainability and limited energy, Ho criticised the idea that these buildings should be torn down just because they are old and obsolete. Ho believes that Singapore’s laws should not encourage such frequent en bloc sales for buildings that are less than halfway through their 99-year lease. Government regulations can reduce en bloc sales by limiting such sales to older properties. Most post-independence buildings designated for conservation in Singapore are state-owned, making any conservation of the privately owned Golden Mile and People’s Park buildings unique. “[Urban Redevelopment Authority] is open to explore win-win solutions with owners of private modern buildings that have merit for conservation,” Kelvin Ang, director of conservation management at the Urban Redevelopment Authority, said in a formal email statement. But what does a win-win solution look like in the seemingly zero-sum world of real estate? 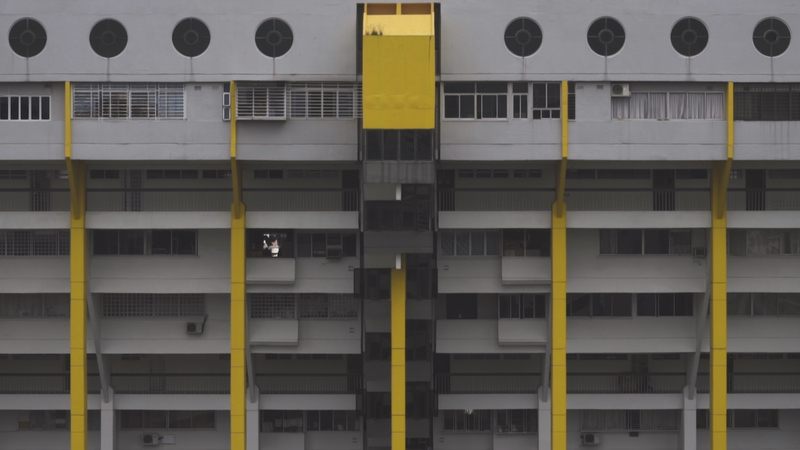 Tan Cheng Siong, a pioneering architect who designed Pearl Bank Apartments, another post-independence Brutalist landmark in Singapore, offered voluntary conservation as a possible answer. For the past three years, he has worked with residents of the Pearl Bank Apartments to create an owner-led development plan, which would allow architects and consultants to work with owners to rejuvenate and upgrade the building. But the plan fell through. Tan had obtained the consent of 93 percent of residents, but proposals for voluntary conservation that will involve alterations to the building require a 100 percent consensus among owners. This makes it significantly harder to gain support for upgrading the building than selling it, which only requires an 80 percent approval. Both Ho and Chang also proposed measures to incentivise developers to conserve the building, should it be sold. For example, if a developer rehabilitates the building instead of demolishing it, the government can waive development charges or extend the leasehold on the land. A more organic and long-term solution would be to let the building gain stature and importance in the public eye over time. 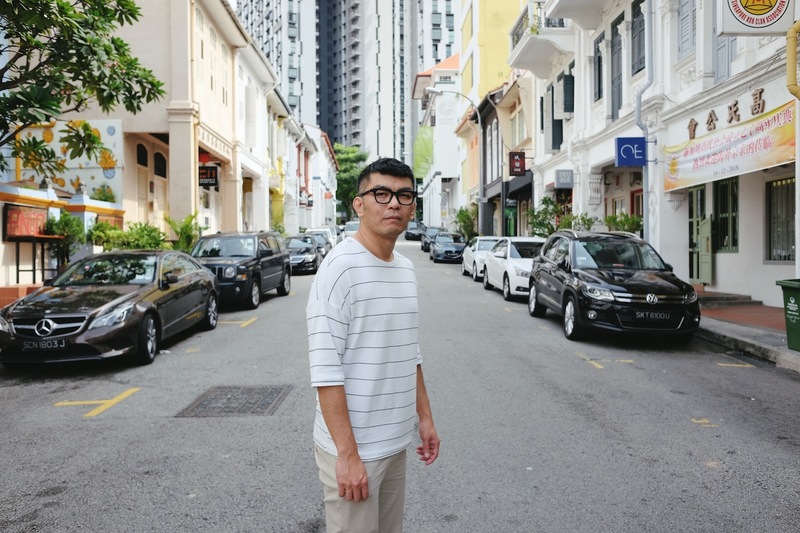 Ho made an analogy to Singapore’s shophouses, which were once dilapidated but have since been designated for conservation by the Urban Redevelopment Authority. “In the past we didn’t romanticise shophouses as heritage because everyone living in them was in dire conditions. But we took a step back, decided to conserve them, and now they are much coveted buildings,” Ho said. Three Liang Seah Street conservation shophouses recently went up for sale at S$30 million recently. He thinks that there is a similar potential for enhancing the value of Golden Mile. The phenomenon has already begun. In recent years, the Golden Mile buildings have been revitalised as young entrepreneurs and creatives take advantage of the low rent and generous space available in the building to set up creative design studios, bars, and an independent cinema. “It is kind of attracting a more artsy crowd because of its pedigree as a piece of good architecture, and it also has a very gritty, urban fringe kind of vibe, with the Thai discos, the bars, the food, and the mixed crowd,” said Ho. 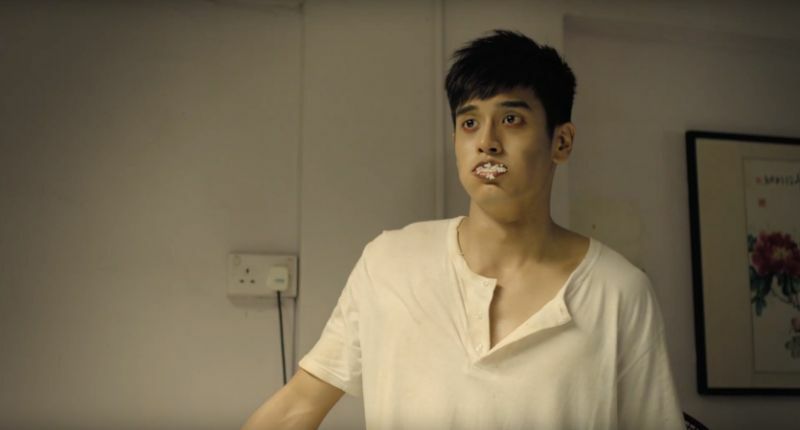 When Karen Tan’s friend told her that his landlord had an old theater with original fittings, floorings and seats on the fifth floor of Golden Mile Tower for sale, she knew she had to do something special with it. She decided to open The Projector, Singapore’s first independent cinema, with her sister Sharon and Blaise Trigg-Smith. The cinema, known for screening films by Singaporean filmmakers and arthouse films, occupies the space that was previously Golden Theatre, which was at one point Singapore’s largest cinema with a seating capacity of 1,500. Two floors below The Projector is Eden, a gallery space created by Zarch Collaboratives, a local architecture firm. Tan is optimistic about the conservation possibilities for the Golden Mile buildings. On a Monday afternoon in August, Ande Lai left his photography shop for a brief moment, letting his wife handle the steady trickle of customers he had—mostly Thai—to give me a tour. He is proud to live here. To him, this building is special and well-designed. We pause at the ninth floor void deck where a high atrium allows sunlight to filter into each of the outward facing apartments. At midday, the bright light illuminates the columns, which are painted royal yellow like the gold that is the building’s namesake. Singapore’s urban landscape is notable for its modern skyscrapers and high-tech designs. But perhaps this high level of development should mean Singapore is more capable, not less, of prioritising conservation over development. This story was originally published in the September issue of the Yale Daily News Magazine.